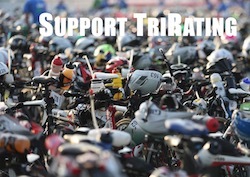 My Spanish friends at BCNTriathlon.com have given me the honor to be part of their team of experts, with the fancy title of “Analista Larga Distancia”. 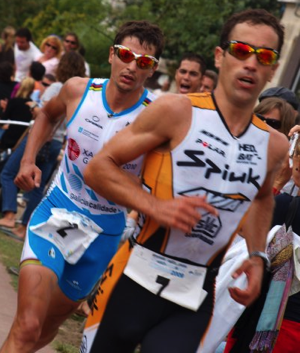 As a little thank you note, I’m having a look at what to expect of the two Spanish Pros in Kona, Eneko Llanos and Ivan Rana. 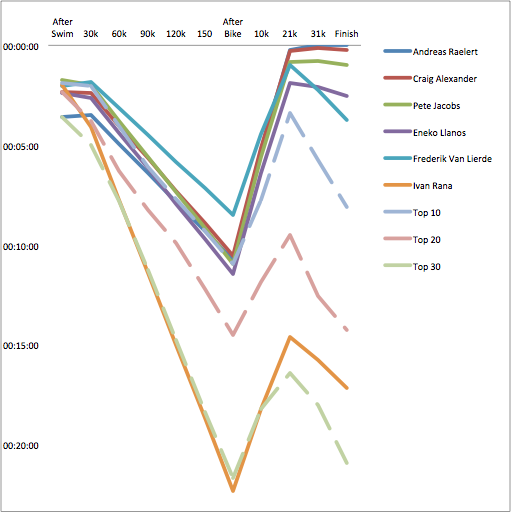 The graph shows how far back each of the athletes is possibly going to be from the front at various points of the race. I’ve also added dotted lines for the Top10, Top20 and Top30. The graph is based on previous results of all the Pro athletes, with a strong favor to recent results and results in Kona. Andreas, Crowie, Pete and Eneko should finish the bike pretty close together. My prediction system is “a bit dumb” by assuming the same speed over the whole leg and doesn’t include race tactics which may have a big influence in Kona. This group should overtake the stronger bike riders around the half marathon mark. Freddie is another “wild card” here, he is nominally a bit slower runner but I’m sure that he won’t let the other just run by him. I have Andreas as the strongest runner of the field – but anything can happen on race day especially when athletes are this close together and race dynamics and tactics come into play. Eneko has been in excellent shape this year, winning the regional championships in Melbourne and Frankfurt. However, he’s not had too many great races in Kona (though he did finish second in 2008), and three big wins in a year would be a very stellar season. I’m sure he’ll try his best to be in the mix – my predictions for him is that he’ll be either in the Top5 or DNF trying. Based on his previous results, Ivan should finish somewhere around #20 (a few athletes nominally finishing in front of him will be DNFs), gaining a few spots on the run. But not all of his three Ironman results may be a good indicator of his real strength: After a disappointing race in Germany, he had to race IM Switzerland three weeks after Germany in order to qualify and probably wasn’t all that rested. If his true potential is similar to his first IM in Cozumel (and he manages to show that in Kona), he may finish as high as in the Top10. Depending on what his goals for 2014 are, he’ll probably be happy with that for his first Kona race and have a focused Kona build in the next year.